There's nothing available at the moment but we're just about to add a new selection to the site. Watch this space! We've been recommending this book to beginners for 40 years and it's still probably the best book to set you off on the right tracks. It's an easy book to approach; quite short, without too much extraneous detail. It's especially relevent to Adana Quarto owners, as this was Ryder's press of choice and features heavily in the book. In extremely good condition; this copy has never been read, and it shows. There's some light shelf wear to the top and bottom edges of the dust jacket, and a small price label in the back. Slightly discoloured with age. We've just sold the copy described above but we'll add another soon. Check back in a day or two, or email us. A dishevelled ex-library copy. The library stamps have been pasted over with plain paper, for some reason. The dust jacket is covered in sticky-back plastic, is well worn around the edges, and has a small scorch mark on the front cover. Pages clear and bright, although several have been scribbled on in blue biro (not enough to obscure text). Tight binding to see it through many more years of service. This book will be of particular interest to anyone who wants to print books. Although some of it is out of date now, it still makes a good read. We've just sold the copy described above but we'll add another soon. Check back soon, or email us. Find out about Roy Lewis's Keepsake Poems, or visit John Easson's museum. First Edition: A Suite of Fluerons. The marble paper cover is foxed, with a couple of tiny brown marks on the back. The pages have remained very clear and the binding is excellent. Letterpress printed in two colours. 1956, Tinlings of Liverpool, Hardcover (no DJ), 56 pages. 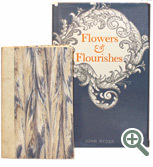 First Revised Edition: Flowers & Flourishes. Ex-library (with tickets and stamps). Some tears around the edges of the worn dust jacket. Pages are clear and bright. Small dark mark to top edges of pages (not visible on the pages as you're reading). Number pencilled on the last page. Includes the sample of Japanese handprinted decorative paper that many copies have lost. Irresistable to any flueron fan. You'll almost certainly have some of these in your own collection. A Suite of Fluerons was first published in 1956. John Ryder ‘watched over every detail of its production by Tinling's of Liverpool with the same care as his own smaller productions’. It's a little book, at 56 pages, and hand bound with marble paper. It was renamed, heavily revised and expanded for the 1976 edition, with some passages and images from the original edition included. Both rare and together even rarer, they make a fascinating pair and we thought it would be cruel to separate them. Great condition, light shelf wear to edges of dust jacket. Some small gluey marks inside the front cover. Pages clear, binding tight. The dust jacket is a little lopsided (spine text is off centre) but this is the case with nearly all the books we've seen in this series! Large photo on the back of Mr Ryder looking moody and interesting. 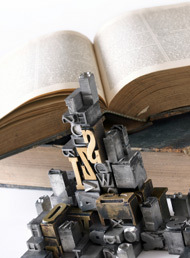 An essay on typography and designing for print, by one of the great exponents of legibility! Plenty of plates.